Being the romantic that I am, the term dining alfresco or just the adverb alfresco has always produced images of a courtyard café in Venice, an outdoor tapas restaurant in Barcelona, quayside dining in the Mediterranean with sun and azure sea, or equally agreeable images. Unless you’re a long haul traveller it’s difficult for us Newfoundlanders to experience the kind of relaxed alfresco dining I’ve just described. Difficult because the weather here is usually not fit for it. Remember last summer? I went to a deck party in the middle of July and people were wearing thick wool sweaters and gloves (no joke). I swear I saw a layer of hoarfrost on the potato salad. Things have started on a more hopeful note this year. We’ve actually had a few days with decent weather. Don’t waste them. And, if on one or several of those rare, beautiful summer days you want to dine alfresco in the manner of Venice and Barcelona we actually have a place for that in St. John’s. It’s the Gypsy Tea Room Courtyard at the Murray Premises, yet another fine addition to the local restaurant scene by restauranteur extraordinaire Emir Mahic. Industry veteran, Grant Fowler, manages all three of Mahic’s dining spots: Evoo, The Gypsy Tea Room and The Gypsy Tea Room Courtyard. 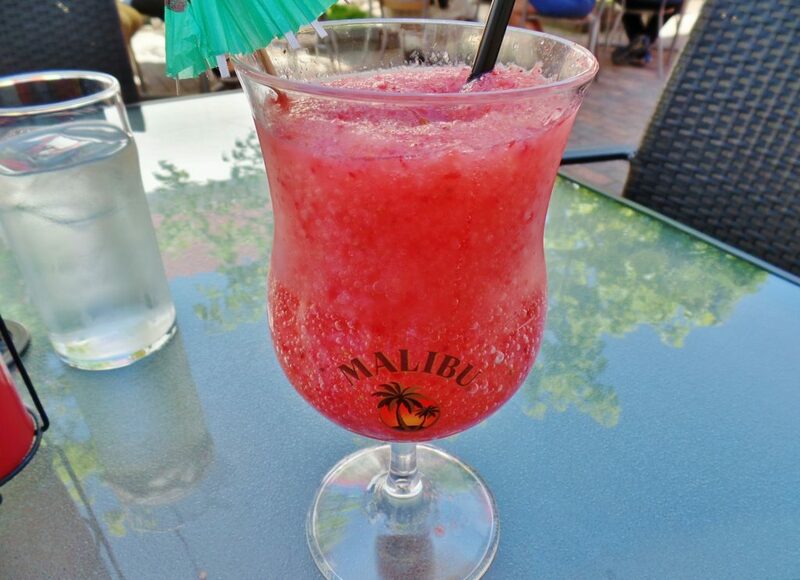 A strawberry daiquiri seemed like the perfect pre-prandial drink for a courtyard lunch. I was expecting a classic strawberry daiquiri where the rum, strawberry purée, simple syrup, lime et cetera are shaken with ice and then strained into a sugar rimmed martini glass. Words like frozen and slush did not appear on the menu, just “strawberry daiquiri” followed by a list of ingredients. Instead of a cocktail or martini glass the drink arrived in a tulip glass (designed to contain frothy beer). And what I thought would be ultra-chilled rum, syrup and lime juice thickened with strawberry purée was a glassful of shaved ice flavoured with those ingredients. It was necessary to hunt with a straw to find pockets of liquid at the bottom of the glass. Then it was a matter of waiting, and waiting, until melt created a bit more to drink. Ever have the experience of biting halfway through something for the first time and within a nanosecond you know you’re eating something so good that when it’s all gone you’ll want to have more? That’s how I felt when I bit into my first wing at the Gypsy Tea Room Courtyard. 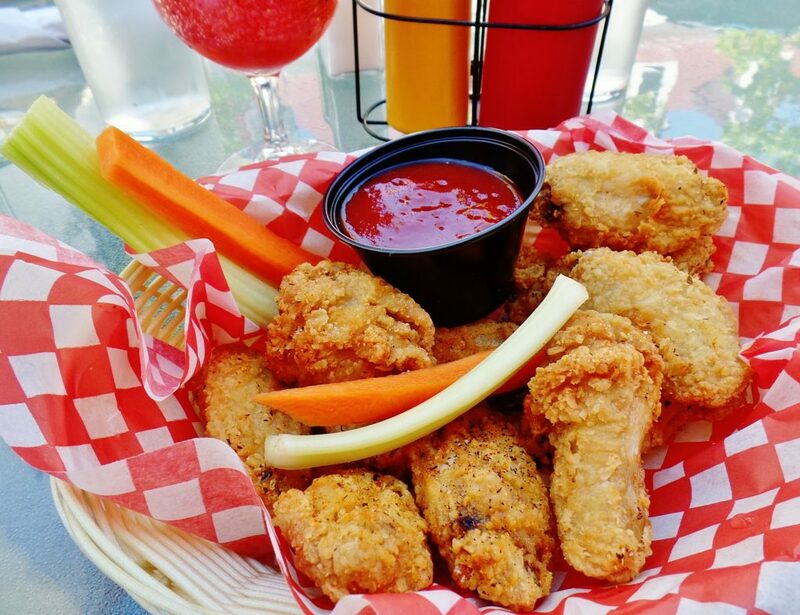 They had everything you’d want in a really good wing: crispy crunchy coating, peppery seasoning and juicy flesh with enough fat to make them much more flavourful than say, chicken strips. For extra heat mild, medium and hot sauces were available, as well as honey garlic and BBQ sauce. I usually don’t get too excited by leafy salads. Meh, a leafy salad is a leafy salad. 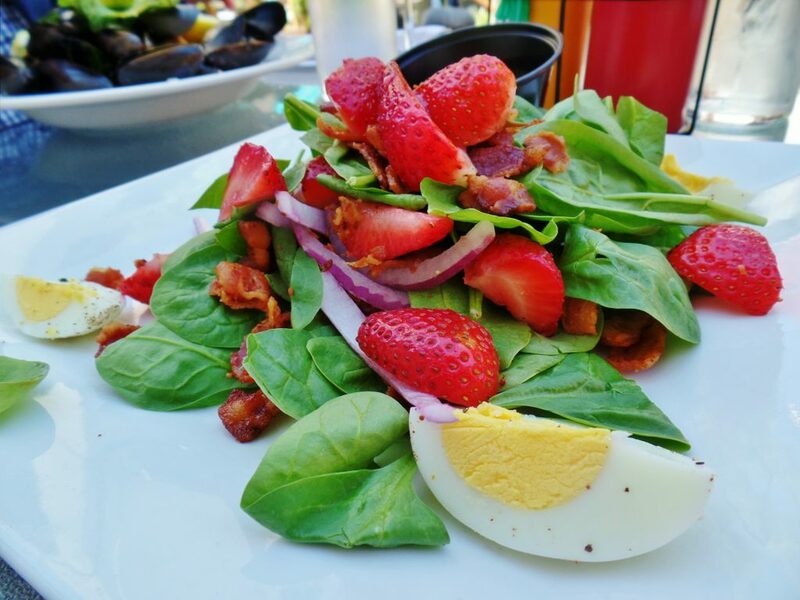 But then I’m knocked back by something like the Gypsy Tea Room Courtyard’s spinach salad. I’m still not totally sure why this salad tasted so good but I think it’s because on that particular day virtually every ingredient on my plate was at the summit of perfection. Spinach, red onion, strawberries, hard cooked egg and bacon were exploding with taste, and well balanced poppy seed dressing didn’t get in the way. Instead it supported and enhanced every flavour on the plate. When chefs spout the popular mantra “keep it fresh and keep it simple” food like this comes to mind. Sometimes things can be kept a little too simple. 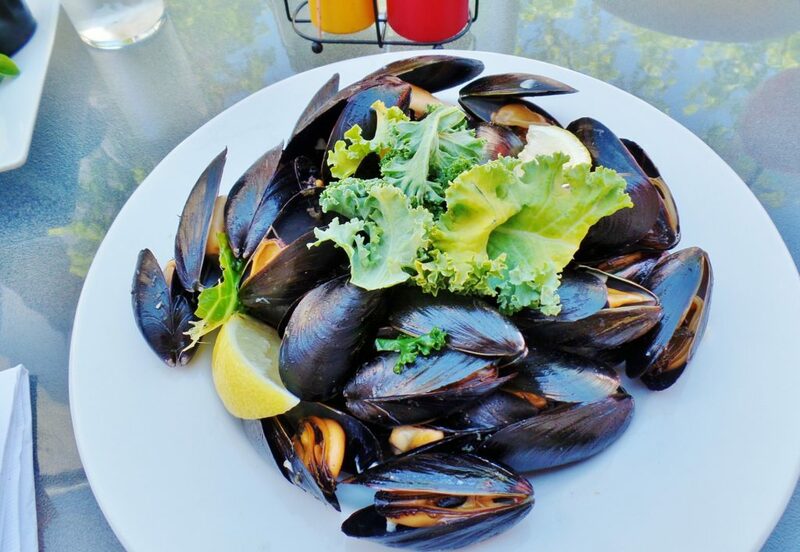 The courtyard’s mussels, for example, were billed as mussels steamed in white wine and garlic with kale. Kale? I wondered what the chef might do with the kale. Well, it was decoration essentially, a few raw leaves placed on top of the mussels to be moved aside in favour of the shellfish. Had the kale been integrated into the recipe I might have been more interested. Simple steamed mussels are fine but this dish would have been much more attractive had finely chopped garlic and onions been sautéed in butter, then white wine added and brought to a boil. Next the mussels and finely chopped kale could have been added, covered and cooked until the shells opened. 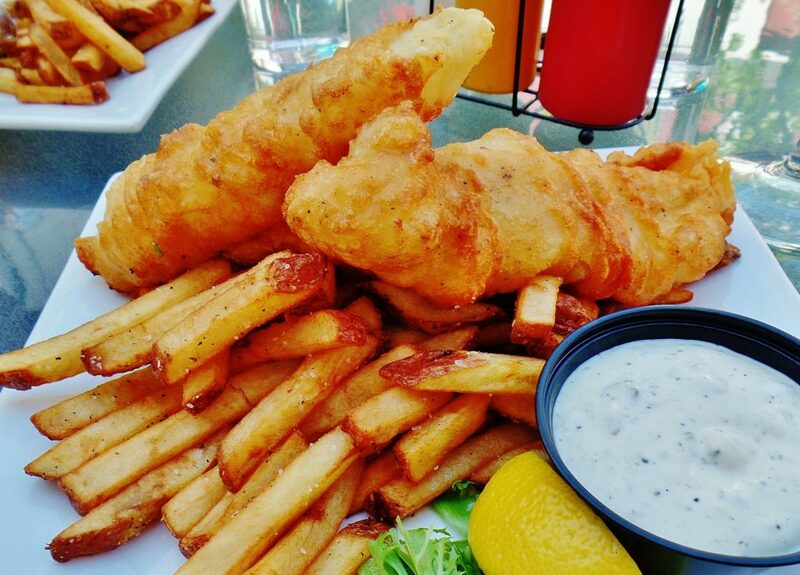 The Gypsy Tea Room Courtyard can be added to the list of St. John’s dining locations that serve excellent fish and chips. (Tourists please take note.) Two large pieces of battered cod, deep fried and golden graced my plate with equally delicious and expertly cooked chips. For the real Newfoundland fee and chee dining experience make sure you sprinkle malt and not white vinegar on your fish and chips. 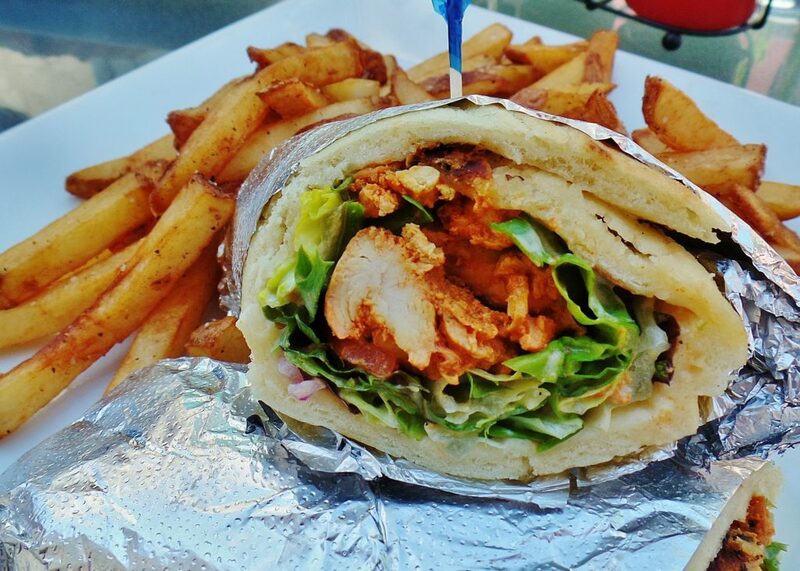 Tandoori chicken wrap sounds like something that should contain at least a hint, and perhaps more than a hint of char. I couldn’t taste much on the courtyard’s wrap, but in spite of the missing smoky element it was a satisfying sandwich. The naan was soft and fresh, the cumin scented chicken breast, raita, tomato, lettuce and onion filling was rich and ample. 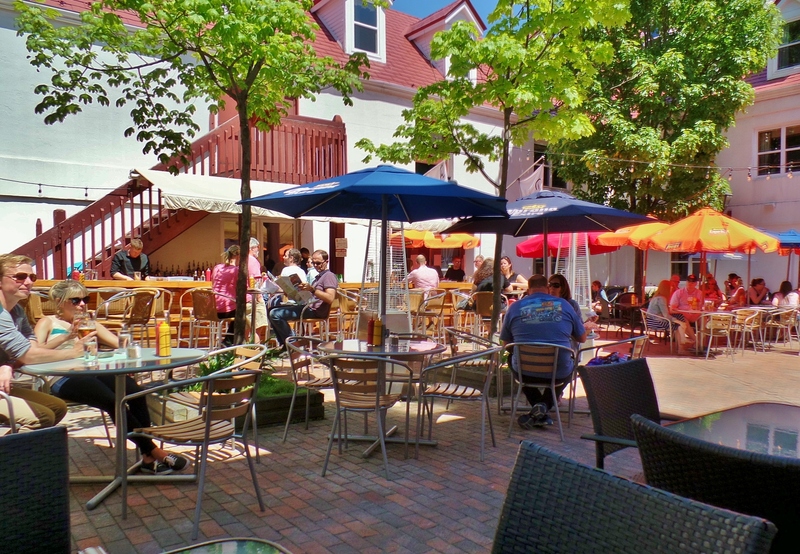 Apart from the excellent food, the Gypsy Tea Room Courtyard provided a lively, engaging setting in which to sip a glass of wine and relax. An outdoor kitchen was buzzing with activity as five chefs grilled, cooked and plated meals. Patrons chatted underneath bright orange and blue umbrellas while bartenders mixed and shook drinks in time with the music. It was the ideal way to spend a few hours on a warm, summer day. Such opportunities don’t come along every day in St. John’s. Grab them while you can. Price A meal for two with appetizers, wine, tax and tip costs approximately $140. Ambiance Lively with music, chatter and colour. Open Lunch Monday to Friday from 11:30 a.m. to 3 p.m. Dinner Monday to Sunday from 5:30 p.m. to 11p.m. Saturday and Sunday brunch from 11 a.m. to 3 p.m. Parking Commercial parking lot or metered street parking. Beverages A choice of 10 cocktails suitable for summer drinking and a small selection of mass produced white, red and sparkling wines. Wheelchair access The Gypsy Tea Room Courtyard is accessible via the Murray Premises at Harbour Drive and through side entrances. Assistance may be required.